A homestead is long in the making. You don’t just wake up one morning with a burning desire to turn your entire section into vegetable garden, purchase some livestock, and develop an obsession for preserving food. It’s a very gradual process. Well it was for us anyway, and after over a quarter of a century and four different addresses, we’ve still got a long way to go. 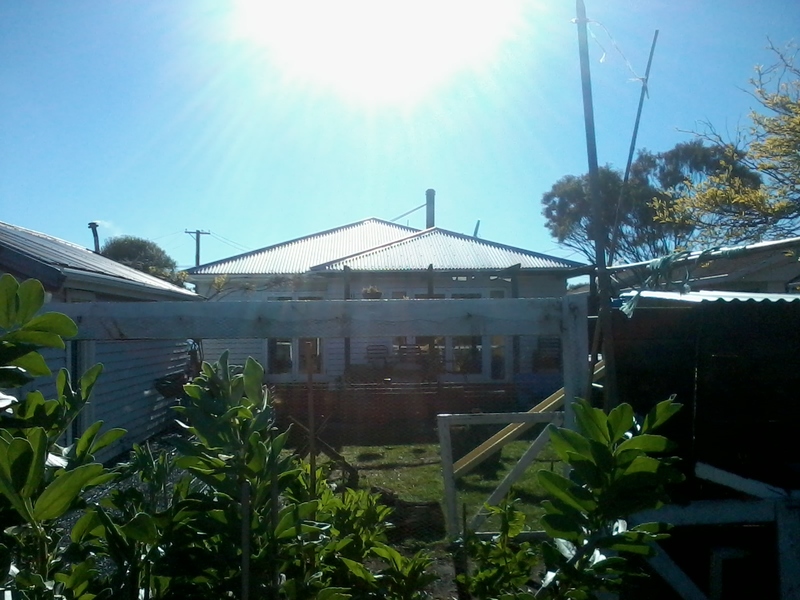 What started with a two by four metre vegie plot (the great cabbage glut of 1992 and resulting recipes is still the stuff of Homestead legends) in the backyard of “a pearler first-home opportunity”, two bright eyed, idealistic kids, and an obsessive attitude to recycling slowly gathered momentum with each change of location until, by the time we left the “house with the vegetables in the flower garden” (the bane of the otherwise tidy Pleasantville cul de sac), we were living pretty frugally (and freakishly if you surveyed the neighbours) for the family of six people we had become. Although our livestock only amounted to a couple of cats and a never-utilised beekeeping permit from the local council, we were by then growing a good lump of our own food and, about six months before our geographical move, had made the earth shattering,gob smackingly odd decision to shun commercial, chemical laden house cleaners we are all led to believe are essential for us to survive – quite literally. To be fair, we were never great purchasers of the multitude of job specific cleaners: the detergents, scourers, deodorisers, antiseptic wipes, sprays, gels and misters. We were more your multipurpose cleaner folk: a polish for the wood, a bottle of scourer for the bathroom and kitchen, a bucket of hot water with a splash of all purpose “liquid lightening” for the floors and paintwork, and a lurid coloured disinfectant for the loo; that pretty much had us sorted. Then our bathroom basin started to block up. Regularly. Fingers were pointed at the pre-adolescent Farmer. To be fair, the Farmer was prone to that sort of thing in his younger days; entire cakes of soap mushed into the shower drain, countless soggy loo rolls that hadn’t quite disappeared when flushed, a handful of marbles in the kitchen waste disposal unit, and (another Homestead classic) a plastic dog figurine (to help move the cows off Thomas the Tank Engine’s offsider, Edward’s, tracks) into the video recorder. But no, the expert we finally caved in a called to rectify this situation ruled it to be toothpaste, more specifically the black gungy stuff that it encourages to take up residence in your plumbing. “If you Greenies insist on not running the water both rapidly and continuously whilst brushing your teeth, what else can you expect?” The only other alternative he offer was stockpiling the chemical equivalent of Peter Jackson’s Uruk hai and pouring it regularly down the plughole. And that right there, that clashing of ideals and convention, “saving the planet” verses “nice and clean”, is how we discovered the wonderful properties of white vinegar (dilute acetic acid) and baking soda (sodium bicarbonate). We quickly found that a couple of tablespoons of baking soda sprinkled into the plughole followed by a good slug of white vinegar and a vigourous plunging works just as well as a chemical cocktail (maybe you have to do it a couple of times, or leave it to marinade for a while, but it truly does) and it’s a lot kinder to your PVC piping. Then we moved to using it on our basins, taps, bath, kitchen and laundry sinks: anything that needed a bit of gentle persuasion to clean up it’s act. Yes, it is scouring these things; we made sure we purchased the sort of fittings that can handle a bit of abrasive action, and bottom line is that cleaning with baking soda and vinegar is FUN! Try it and see. Don’t get us wrong, we’re not anti progress or development. We don’t know how happy we’d be undergoing surgery in a theatre or eating at a restaurant which depends on a splash of white vinegar to meet its sanitary requirements. We wonder, though, how necessary that standard of “clean” is in your own home where you control where the raw chicken is stored and know the cook washes their hands before preparing the chilli. We’d rather know what the basic ingredients and the chemical properties of the stuff we use to clean our home; the artificial deodorisers, stabilisers, colourants, emulsifiers, thickners, etc are not important to cleaning on the scale of one home, but they’re all in there bringing with them their own happy band of toxins. Anyway, the vinegar/baking soda thing was just the beginning. Before long we’d sourced recipes, tutu*-ing and tweaking them so they did what we wanted (cleaned the place) without decimating the natural balance. The natural wood (unvarnished) in our house is now cleaned with a combination of turpentine and beeswax (super bonus was using our own bees wax), the varnished surfaces get buffed with a mixture of water and good olive oil. All that electrical stuff that attracts dust (and goat hair, hay fragments, sawdust, and all that other stuff that magically adheres to the sound system) cleans up with a water damp cloth, and we clean our floors, light switches, window sills, walls and whatever else is a bit grubby with a mixture of white vinegar and grated pure soap in a bucket of hot water. You can add borax apparently to beef it up a bit but we haven’t needed to. Adding a few drops of essential oil to the mix makes the place smell…well, clean. Lavender is nice; So is Lime. Okay, we admit to not being a show home, our abode hasn’t appeared in any photo shoots lately, but our home is clean and the bonus is that it doesn’t smell like a public toilet. Of course, because of the way we’re conditioned (don’t get us started on that) we now think the synthetic, over deodorised whiff of the commercially cleaned bathroom is the smell of clean. How did we get duped into that? The next step was our laundry. Why attempt to eradicate chemicals from your physical environment when you’re clothes and bedding, the stuff closest to you, are being cleaned by them. So we experimented. We used grated pure soap, but that was a bit hard on the washing machine and worked best with hot washes, which opened up a whole new can of worms. Then we heard about soapnuts. The fruit of the Ritha (Sapindus Mukorossi) tree, we boil up about twenty of them, once a week, in a huge pot of water. Strained and cooled, you splash about an eighth of a cup of it into each load of washing. You do need to store it in the fridge, but we consider it worth it. You can put the whole nuts (in a calico bag provided) into your machine and eliminate the need to boil up soapnut soup weekly; Maybe our knot tying left a bit to be desired, but we found escaping soapnut segments kept blocking our washing machine filter and it was a bit embarrassing explaining what it was to the appliance repairer: “it looks like specks of soggy bark. What? You use it to wash your clothes?” For the grass stained knees, dobs of paint, beetroot stains and ingrained mud we have a few big guns in the arsenal. Spot cleaning with pure soap and a toothbrush and then washing soda (sodium carbonate) in a hot wash with white vinegar in the rinse cycle works well; if it’s still there we use oxygen bleach (sodium percarbonate). We also shun white clothes; why make life difficult?! Again, our clothes do not smell of “surf”, “seabreeze”, or “sunshine” but neither do they smell, if you know what we mean. Clockwise from Right Back: NZ Olive Oil, OxyBleach, Soapnut Liquid, Essential Oils, Laundry Soap, Washing Soda, Soap Nut Shells, Baking Soda, White Vinegar, Grated Laundry Soap, Furniture Polish. For a long time we have been toying with different personal cleaning potions. The internet is choked with recipes for natural deodorants and antiperspirants, shampoos, toothpastes but none that we have tried are up to scratch, and with two of our number working off Homestead in the service industry, we need to be sure we look and smell…acceptable. The Bean Counter utilized the lack of amenities after the earthquake to go “no-poo”, his hair no longer requires shampooing, and you truly can’t tell. The rest of us couldn’t handle the greasy, lank hair you had to contend with while their hair sussed itself out. The Goat Herd is currently experimenting with a dry shampoo. If it’s successful, we’ll let you know. And so to the happening this week that prompted this blog theme: soap. Oh, how we’ve tried to create soap. Admittedly, we’ve got pretty strict criteria; We don’t consider buying grated soap, sticking it in the shape of a bar of soap and then calling it soap making as being the real deal anymore than buying cookie batter, cutting it into shapes and bunging it in the oven is baking. Anyway, the Goat Herd finally did it: achieved soap that looks, smells, behaves and appears to be drying like real, honest to goodness soap. Currently it is curing on top of our indoor laundry rack which we felt best met the warm and airy requirements. Can’t wait. So little by little we work out way down the Homestead list, and day after day we continue to add stuff to the bottom of it. If the soapmaking succeeds, then onto the next thing: shampoo, toothpaste, sunblock even. If not, back to the drawing board. Maybe you’re interested in our cleaning recipes: drop us a line. Maybe you have a better one: we’d love to hear about it. To borrow from Paul West’s (River Cottage Australia) Dad, every day is a school day. Over our Homestead journey to date, the biggest thing we’ve learnt is that nothing need be perfect, it just has to work for us. It’s a liberating thought; and when you get it, life is pretty damn cool. 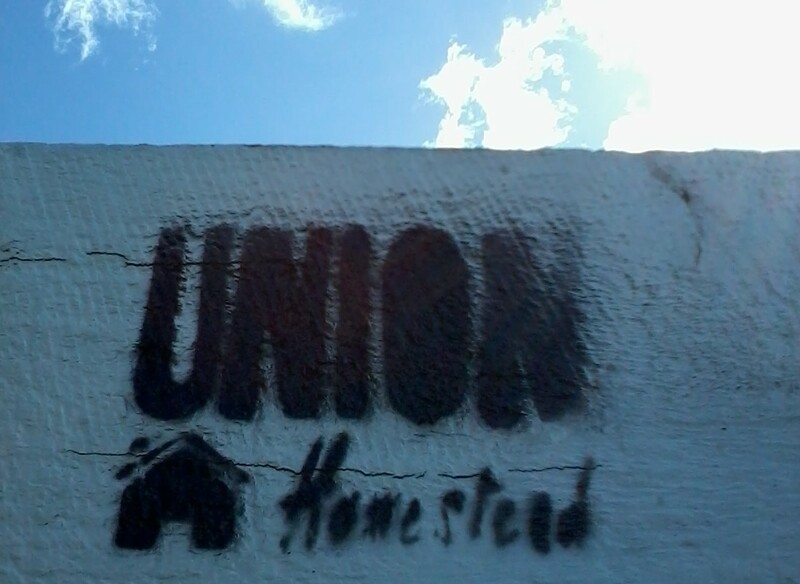 © Copyright Union Homestead, 2014. All Rights Reserved. This entry was posted in Union Homestead and tagged Aotearoa, baking soda, Chemicals, Christchurch, Cleaner, Cleaning, Cleaning agent, Cleaning Agents and Toiletries, dry shampoo, Family, frugal living, gardening, Home and Garden, Homestead, Laundry detergent, natural cleaners, New Brighton, New Zealand, no-poo, Paul West, Permaculture, produce, River Cottage Australia, safe cleaners, saving the planet, self sufficiency, Shampoo, Shopping, Soap, soap making, soap nuts, Sodium bicarbonate, Vegetable garden; DIY cleaners, Vinegar, Washing machine, whanau, white vinegar. Bookmark the permalink.